Still, the sessions seem to be part court proceeding, part intervention and part counseling session, among many other possible descriptions. For the following, at Lemon’s insistence, no names or identifying characteristics have been used in describing defendants. No photography was permitted. On a Tuesday in June on which Lemons invited the Daily Times into his courtroom, the judge, along with several probation officers, local rehabilitation counselors and other interested parties, were to meet with 22 drug offenders. Lemons reports right off the bat that nine of the 22 are AWOL or in jail. “This is not a good day,” Lemons said, adding usually there is some good news coming out of his courtroom. In the long run, depending on the outcomes of several cases, it seems likely there will be good news to be shared about the events in the courtroom this day. But there are problems evident as well. As already indicated, all the defendants are addicts or recovering addicts. All also have lost, or are in danger of losing, custody of dependent children. A few are not as advanced in their recovery as Lemons and others would like. Prior to bringing in any defendants, Lemons sits behind his bench as probation officers and others go through a run down on the status of each defendant. The very first person discussed is AWOL. Lemons orders a warrant issued for the person’s arrest. The next defendant is already in jail, pending charges to be dealt with in another court room. The third defendant is another AWOL and has missed three appearances. Another arrest warrant is issued. The status of the fourth defendant seems a bit trickier. Various persons in the court contend the defendant is not doing well, however Lemons seems ready to give this person a break if he sees signs of cooperation. Court officials describe yet another defendant as being in somewhat the opposite status, in other words, doing much better. Officials do state the defendant has been in and out of jail and tested positive for cocaine. One drug counselor offers the opinion going to jail may have done the defendant some good. Court is supposed to start at 10 a.m. A little after 10:30a.m., about 20 defendants begin to file in. Accompanied by a bailiff, one is in a jail jumpsuit and restrained with handcuffs and leg shackles. The court room is noisy, defendants chatting with each other, court staff and counselors, even approaching the bench and talking casually to Lemons. The first defendant to take the stand is the one in handcuffs. The young woman apparently was picked up on drug charges, not for the first time. She quickly becomes emotional. “As absurd as it sounds,” Lemons tells her, “some of them here have thanked me for putting them in jail.” This comment is met by nodding heads and a smattering of applause. Lemons tells the defendant she needs to take advantage of the opportunities drug court presents her. From the outset of their discussion, it seems clear Lemons wants the defendant to go to in-patient rehab. What also seems clear is the defendant wants no part of the judge’s suggestion. “I just need to go home,” the girl says repeatedly. Persons in the audience, including other defendants, do not react well to that comment. “You go home, you’re just going to get high,” states one defendant observer, gaining herself a round of applause. Court administrator Dawn Keller-Phillips says the defendant’s behavior is sending up red flags to everyone in the room. Ultimately, she is sent back to jail. Despite some apparent progress, the next defendant has earned jail time according to Lemons. However, the judge states he does not want her to lose her job. He apparently sent her to jail previously. “We needed to get your attention, I hated to do it that way,” Lemons said, echoing comments made earlier about another defendant. He works with the offender to come up with times outside of her work schedule when she can serve her time behind bars. Another defendant does not win much praise but instead elicits a lot of concern. The defendant and her husband, also a defendant in the drug court, were seen in a bar. Both say they were just there to eat. Neither the judge nor the defendants in the audience buy that excuse. The woman insists she has her addictions under control. She admitted she had a few drinks but also argues that is no big deal. Lemons counters with the assertion the defendant is in denial and needs in-patient rehab. The court proceedings are very informal and what follows is a lot of talk and advise coming from other defendants in the courtroom. One defendant disagrees bitterly that an addict can go to a bar for just a drink or two. “I know if I take a drink, it’s off to the races,” the woman says. In the end, Lemons sends her to jail for three days after which she will be required to report to an in-patient rehab facility until such a time as her recovery is complete. Lemons did not respond to numerous requests for comment following the above described court session. However, in April, Lemons was one of several local officials to attend the Scioto County Medical Association conference on addiction-related issues held at the Greenbrier Resort in West Virginia. According to a PowerPoint presentation Lemons presented during the conference, Scioto County’s drug, or “Family Reunification,” Court was established in 2014. 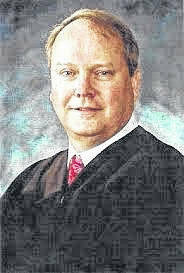 In his presentation, Lemons described the court as a specialized docket certified by the Ohio Supreme Court. “The purpose of the Family Reunification through Recovery Court is to effectively deal with parents and caregivers who are addicted and unable to properly care for your children,” Lemons said during the Greenbrier presentation. That presentation included lots of stats and figures on drug addiction in Scioto County. For example, Lemons reported Scioto County has the highest rate of incarceration for drug offenses in Ohio, nearly six times the Ohio average. In January 2015, the state average of drug-related incarcerations was 6.4 incarcerations per 10,000 persons. The same figure in Scioto County was 37.9. In Scioto County. That averages out to about 280 cases per year. ~ In 2016, Scioto County Juvenile Court saw 46 abuse, neglect, dependency/custody cases from January to February. In 2017, during the same time frame, the court saw 72 such cases, an increase of 157 percent. No figures were readily available for 2018. In his presentation, Lemons noted these cases almost all involved the use of an illegal substance by a defendant who was pregnant or had children in the home. ~ Lemons asserted there are now 8.7 million children in the U.S. who go home to addicted parents every day. “That’s three out of every classroom of 25 students,” Lemons said. On Friday, Ohio Attorney General and gubernatorial candidate Mike DeWine was in Portsmouth touting a 12-step plan to attack Ohio’s opioid problem. DeWine said after studying Lemons’ Scioto County court room he made creating at least 60 more specialized drug courts his fourth priority on that 12-step list. He added he often holds up Scioto County as an example of an area which has been willing to fight back against the drug epidemic. In terms of law enforcement, DeWine also talked about expanding drug task forces specifically targeting and disrupting the flow of drugs and money from Mexican drug cartels. Following some brief comments with the Daily Times, DeWine and running mate Ohio Secretary of State Jon Husted held a roundtable on drug related issues with various local officials, including Lemons, Scioto County Commissioner Bryan Davis, Portsmouth Police Chief Robert Ware, county health officials and others. The Daily Times was asked to leave by DeWine’s staff and was not privy to the roundtable talk. Unfortunately, there are no statistics readily available regarding the number of persons who have successfully completed Lemons’ drug court program. In addition to attracting DeWine’s attention, the program has attracted some positive publicity outside the state to include a Wall Street Journal article which ran in May. Lemon’s complete Greenbrier presentation is available online as is the Wall Street Journal article, under certain conditions.